Like most of you out there, Chase and I love our coffee. 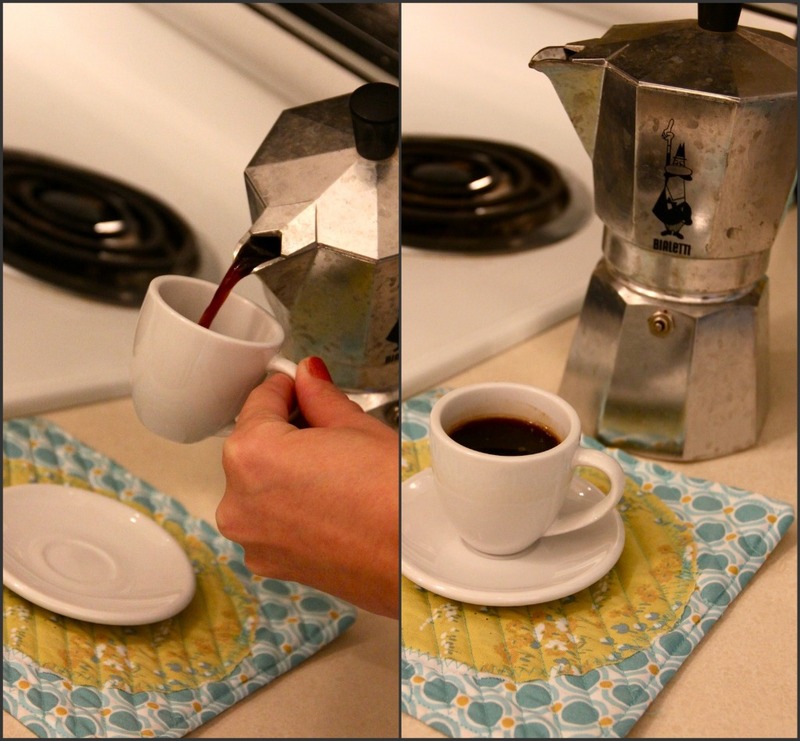 I think we *might* be coffee snobs, as we typically only drink it in espresso shot or french press form. When we came back from our conference this past Sunday, we both were in need of a little caffeine jolt. Chase made some espresso to make an Americano & I made a homemade iced caramel latte. It was delicious, so today we made another round and photographed it so that I could share it with the masses. Enjoy! 1. Grind your coffee beans on the "fine" setting. 2. 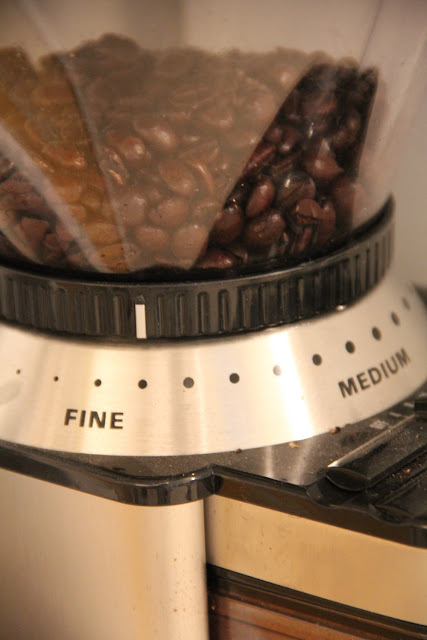 Fill your espresso maker with water up to the line on the inside. 3. 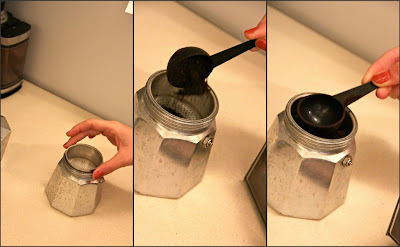 Fill the filter with the espresso grounds & pat it down with the back of the scoop. 4. Make sure there are no grounds around the edge, by scraping them off with your finger. Screw on the lid as tightly as possible. 5. 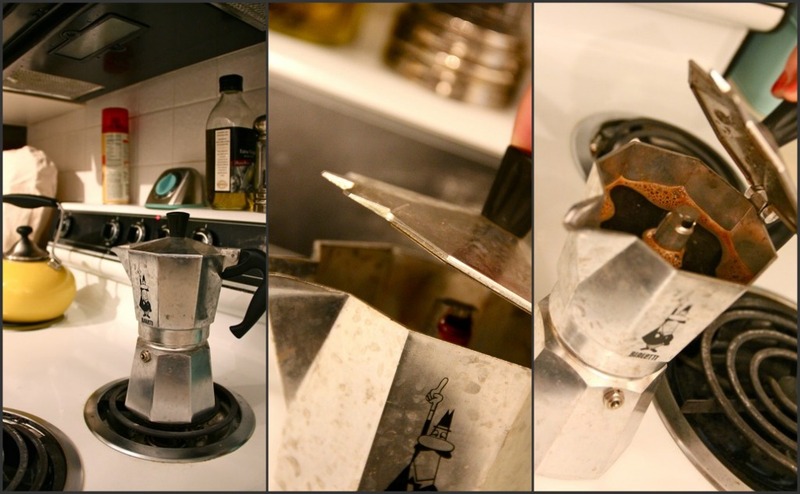 Put on medium high heat on your stove until the water boils & the espresso starts to come up into the top chamber. As it starts to fill with espresso, remove from stove until it's full. 6. 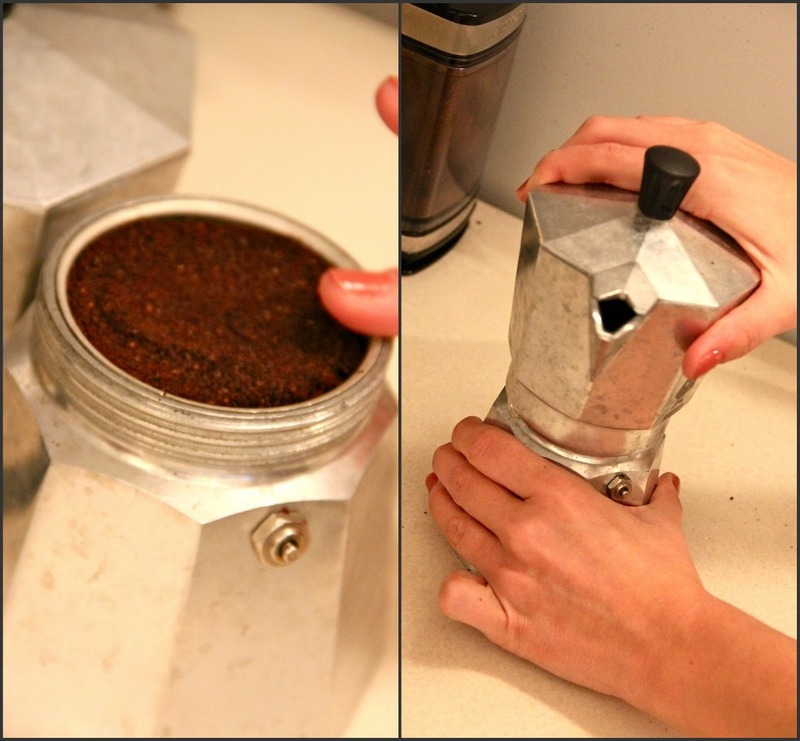 If you would like to know exactly how many "shots" of espresso go into your latte, pour it into espresso cups. 7. 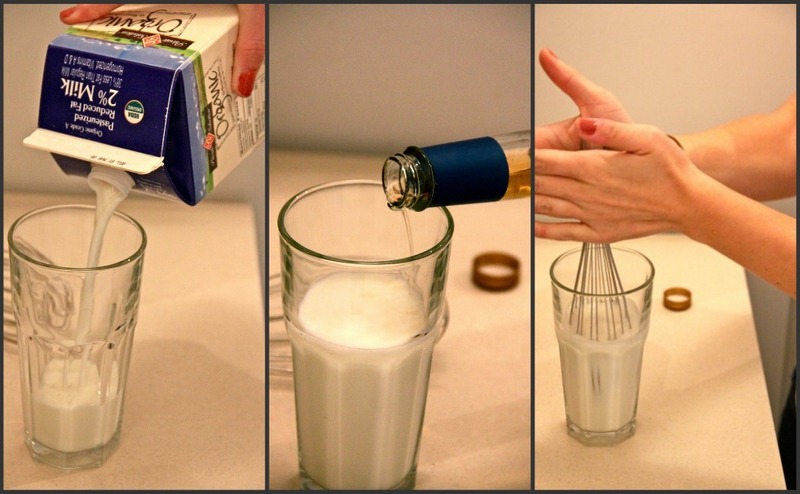 Pour milk into glass. Pour flavor syrup into milk & froth the milk. I use a whisk and move it back and forth in between my hands. This is what it should like "frothed"
8. 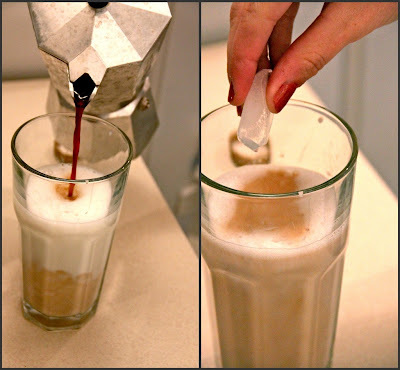 Put in desired amount of espresso & ice cubes. 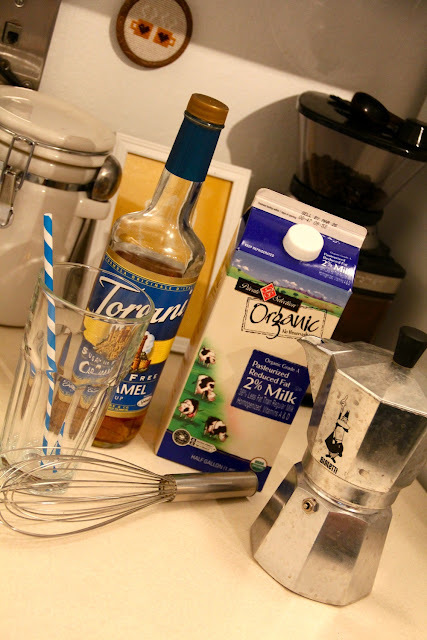 **note: I buy my Torani syrups from World Market. The espresso maker is from Williams-Sonoma. 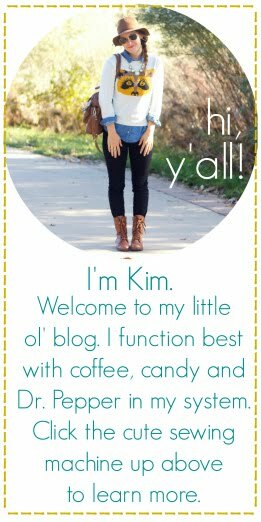 Kim the barista! I love it! 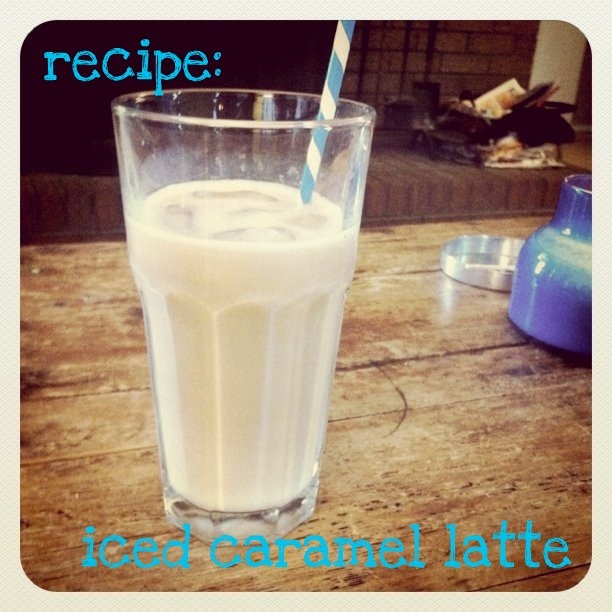 And that latte looks so delish! Um, that looks like way too much work for me. Can you just please come over here and make me one? Pack your cute little self up and come visit. YUMMMMM....i will totally try this with the hubs friday night. we are having company and this will be a nice treat! YUM!!! Is that also a coffee grinder?? I want...! You look beautiful and that drinks look YUMMY! i need that espresso maker!! if i'm not drinking starbucks, then i'm making french press coffee at home. but, you're espresso maker is to die for! yum! and that volcano candle my most favorite candle ever! I was just thinking how cute you looked! Makes me want to cut my bangs again and wear a side braid. Yummy! 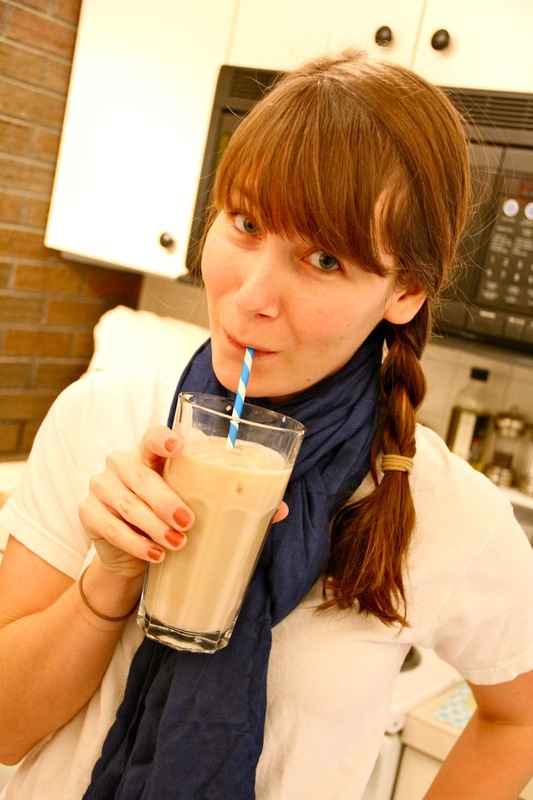 Where do you find your super cute, retro straws? Love. Mmm, this sounds absolutely divine! you are so cute, make-less and all!! loving that. love me some sugar free torani syrups. and at home bev's. looks deelish. if I didn't give up coffee for lent... I'd go out and buy an espresso maker riiight now!